Which area of the country are you in, and are you still getting results from your first post - paying for 60/10, but only getting ~ 11 down most of the time? At my residence, I'm paying for 50/10 through Comcast, and consistently get it (my downloads are actually closer to 60Mbps most of the time), and TMN consistently verifies I'm getting what I'm paying for. It also verifies EBrown's Comcast 50/10, as well as a colleague of mine who lives about 30 miles North. If TMN is measuring less, I'd believe it, but I also believe you need to validate that with other real-world transfers to show the Comcast people they're FOS. At our office (which is about 7 miles from my house, in another suburb), we just got the Comcast Business 150/20 installed about two weeks ago. On that, the 20Mbit upload is consistent. Downloads, on the other hand, are more like 50Mbps. TMN verifies the "real world" results with other transfer tests, and jives with our NMS monitoring. The Xfinity speed test measures it at 107/20. When we first looked into Comcast Business several months ago, 100/20 was the fastest plan available, and it was only recently that 150/20 was available, although the sales guy said our building would need a new line drop to support it. That never happened, and I believe that to be the reason of the slower speeds. I haven't yet tested from their modem (bypassing our equipment), but will likely take it up with them in the Sping, when weather would allow a new line drop. Even the 50Mbps for us is sooo much faster than what we had before, so we're happy for now, but still not getting what we should. Last but not least, have you performed a packet capture during a transfer test, to see if there is packet loss happening? I've been in contact with someone from Comcast Executive Care for the past 4-5 months now (which is pathetic). I finally convinced her to upgrade me to the 105/10 package for a week to see if it fixed anything. Unfortunately, it didn't fix a damn thing. As a matter of fact, I'm now only getting Kbps speeds on my Upload where it was fine before. To answer your question, I barely get 11Mbps. Most of the time I get 1.9 exactly on my download tests. I went away for a week to my families house and I was able to do everything perfectly fine (and fast with zero buffering or stutter) on wireless internet with a 16/2 connection. I come back this week to not being able to watch or download anything above medium quality and it STILL buffers most of the time. Yet Comcast to this day tells me my internet is just fine. If there is anything you recommend that I can test/do/give to these Comcast twats to PROVE their internet is completely jacked up, I am all ears. I want this over with. Totally forgot to answer your first question. I'm near Chicago, IL. I think the key is convincing them to send out a tech who will do more than just do the Xfinity speed test like any monkey can. If they don't believe the TMN tests, fine - there are plenty of other ways to demonstrate download performance is poor. Give them a list of ten distinct download URLs to show that they are all slow...and I still think you should do a packet capture to look for packet loss, as I'm pretty sure you'll have it. You can also try quoting the classic line from the old Heaven Can Wait movie: The likelihood of one individual being right increases in direct proportion to the intensity with which others are trying to prove him wrong. I've had over 20 technicians out to my house over the course of this issue. All claim to have fixed the line, nodes, boxes, wires, modems, etc. They claim it's MY equipment when it's very clear it isn't my equipment. There's no use in me asking for another technician because it just makes me angry now to explain my situation and them just repeating themselves and basically calling me a liar, then leave. 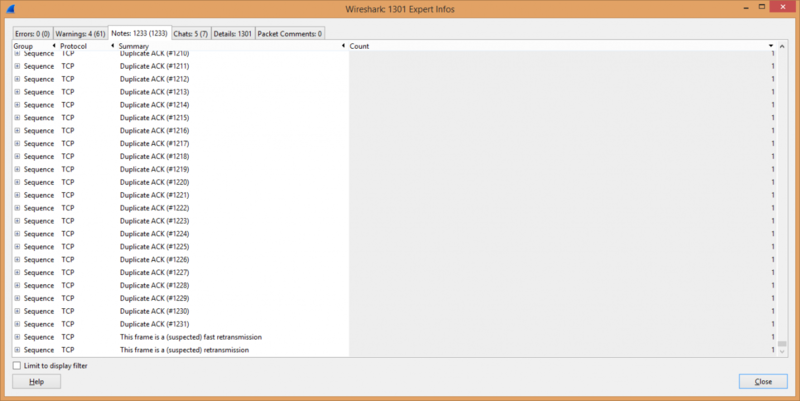 Could you explain to me as to how to do this packet capture? Last time a tech was out, they told me I had zero packet loss. So what would this insinuate? This was a test I ran for about 30-60 seconds. 1) Traceroute to mirror.anl.gov [146.137.96.7] which is the Argonne National Laboratory in Illinois, which should be a lot closer to you than me. 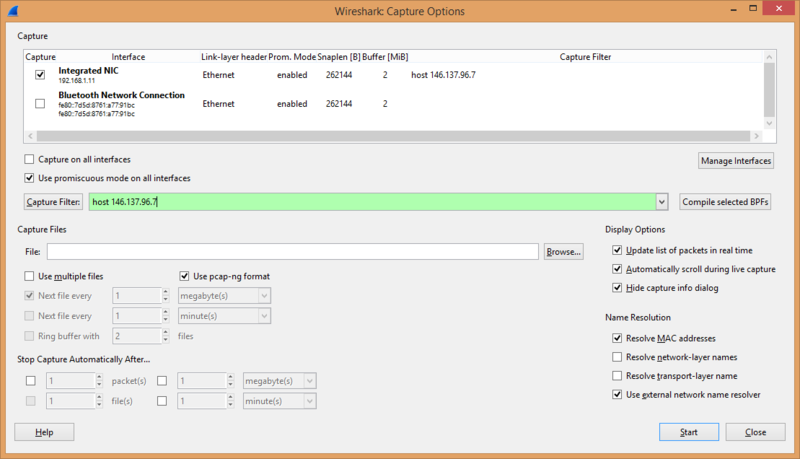 2) Launch Wireshark and enter a capture filter for host 146.137.96.7 on your Ethernet interface and start a capture. 3) Download http://mirror.anl.gov/pub/centos/7/isos/x86_64/CentOS-7.0-1406-x86_64-NetInstall.iso I can download this 362MB file in under 60 seconds at over 50Mbps. 4) Stop the capture, and then look at your expert infos. I had two retransmitted packets for the download. 11 14 ms 16 ms 26 ms ciscore-v911-221c1hsrp.net.anl.gov [130.202.212. How fast was your download? How long did it take to download? About 3-4 minutes. So definitely slow, but no perceived packet loss. Let's try something further away for both of us, mirror.flhsi.com [208.65.55.17] in Florida. http://mirror.flhsi.com/centos/7/isos/x86_64/CentOS-7.0-1406-x86_64-NetInstall.iso (same file as the other mirror site). I can still download in under 60 seconds (more that 50Mbps). I had 17 retransmitted packets. 12 44 ms 45 ms 44 ms te4-2.ccr01.mco01.atlas.cogentco.com [154.54.29. Took me 5-6 minutes to complete that download. Retransmission count? The purpose of the exercise is to see if packet loss is evident; and secondarily, to compare your download rates with "known fast" sources. Even if no packet loss is present, these two tests have already demonstrated that your transfer rates are far slower than they should be. We could do this forever...how many sites does it take to convince Comcast that the real-world downloads are slow? Granted they are also blaming your computer, so another key is demonstrating the slowness using multiple computers, each wired to the cable modem to eliminate any other possibilities. If I were a Comcast tech, that's how I would test it. The key is finding someone who will do it properly. As I mentioned before, our Comcast 150/20 service in our office doesn't seem to be performing as it should (for downloads), and I will have an opportunity to test it tomorrow (straight from the modem with multiple computers, bypassing our local networking equipment). If those tests pan out that something isn't right, I will raise the issue with them, even if they can't replace any cabling or whatnot until Spring. And once a real problem has been established, I will stick to it and keep on them....I won't back down from a technical fight. My issue is, even though we know I have slow download speeds, I have nothing I can show a basic Tech (who'd at least understand what's going on) or proof I can send Corporate (or at least proof they can understand) to show them my internet is garbage. That's where my question comes in; is there something I can provide to corporate and/or technicians that will show them PROOF that my internet is not up to par? Well, corporate people understand spreadsheets, and that is how we initially presented the problems with our last provider...listing ten "known fast" download sites, and how our results compared to other ISPs we had access to. We could always do something similar with participants here, as many TMN "members" use Comcast - come up with a matrix of how your performance differs from others using the same download sites. But then again, that's the whole point of TMN in the first place, and it is unfortunate that they don't take it seriously. So I've been testing our office Comcast Business 150/20 recently, and it's been performing adequately. Single-thread TMN downloads I can't get to go above ~108 Mbps for the average, but they do peak at close to 150. We can consistently fill it up with multi-thread downloads, and almost get to 170 (testing our own CDN and other third-party downloads). This is good for us, but alas I don't have room to complain to Comcast about performance. Still, it does indicate that TMN measures various Comcast connections reliably. I am with Comcast and am going through the same things as the topic creator. I've been through about 6-7 techs all claiming everything is fine. One rewired my power lines and cables inside my house. I also purchased a Surfboard and got the exact same results as the 10-15 router/modem combos that Comcast has given me. I game on my PS3, XBOX 360, and PC. I get constant lag on all of them. My speeds are usually 20/4, despite paying for 75/15 with a cable connection but they fluctuate constantly. However, I recently switched to Verizion Fios' 75/75 package, Unfortunately I experienced the exact same thing as Comcast. My speeds were much higher but they fluctuated much more. I went through a few techs and routers with them as well before I cancelled my service to avoid getting locked in a contract. Anyhow, I just wanted to give some insight and hopefully save you from making a jump to another company without checking other alternatives. I am right outside of Philadelphia, Pa by the way. My only assumption is it's an area thing. Well to be honest, I don't think this is an area thing. It was working when I first moved in to this place for roughly 5-6 months. Then things went spotty. It fixed itself over the course of 1-2 months, and now it's back to acting up again. It's been like this now for about 5-6 months solid with crap internet. I almost went with Uverse but considering their packages are complete crap (18DOWN/1.2UP) I can't justify that purchase.